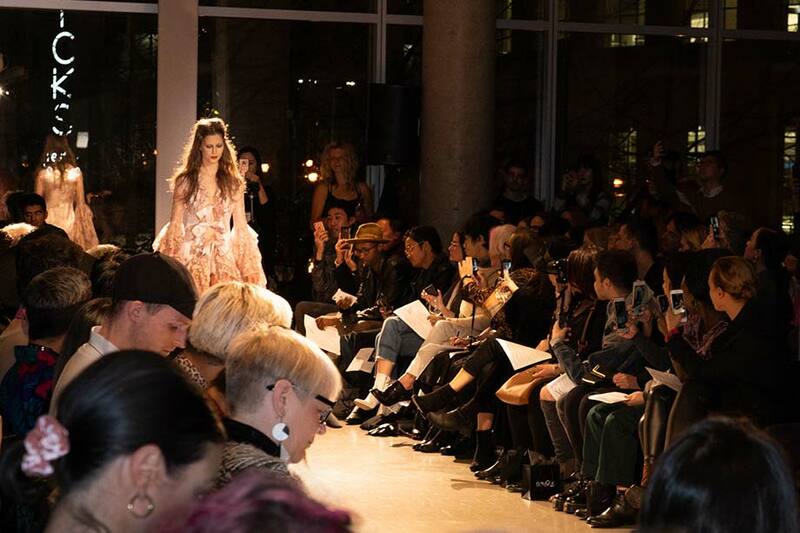 Over the course of two unforgettable November nights, Vancouver’s fashion elite witnessed an explosion of new design brilliance at Cherry Bomb, the 2018 Blanche Macdonald Fashion Design Graduate Show. 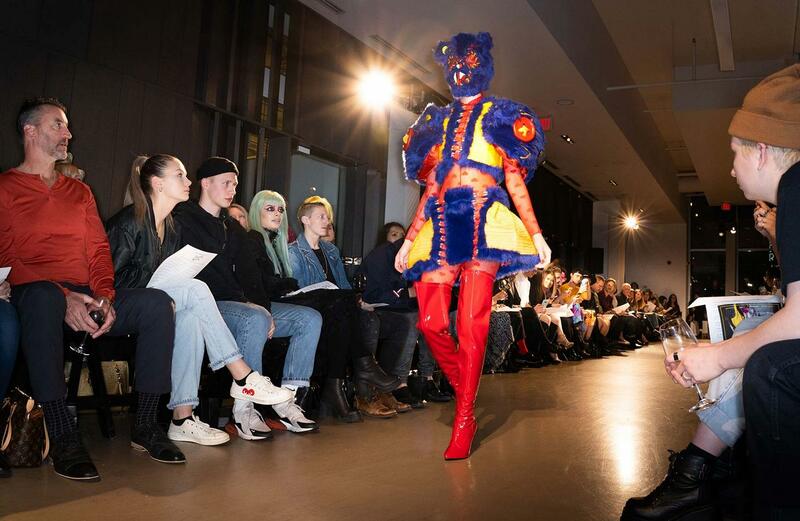 The fruits of the graduates’ labours were on display at Blanche Macdonald’s Atelier Campus as a pair of invite-only audiences gathered to experience debut collections from some of Canada’s brightest young design talents. 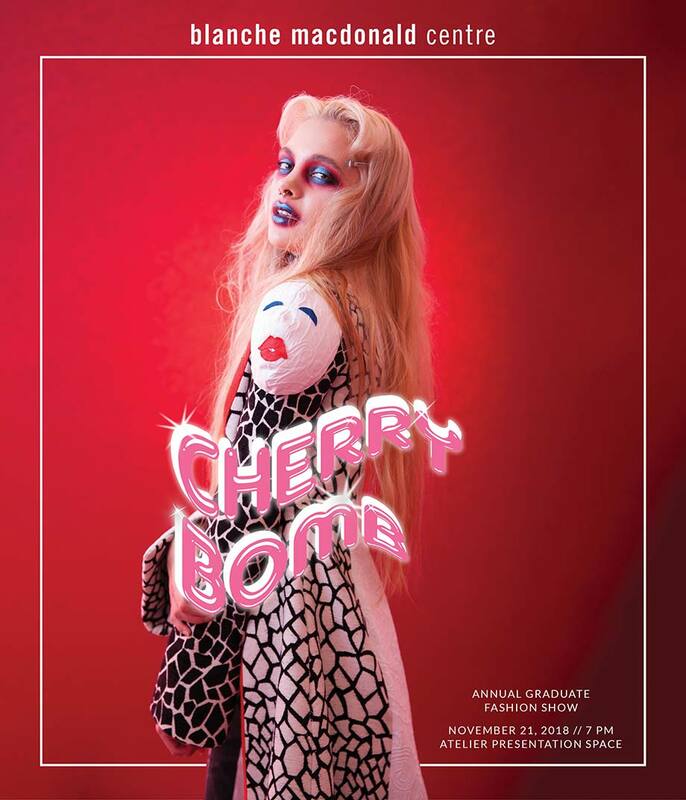 Cherry Bomb was a myriad of cool, chic collections full of cutting-edge modernity. 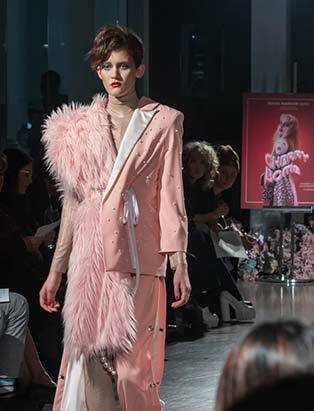 The chic collections were perfectly at home in Atelier’s ultramodern architectural space, aided and abetted by backstage styling, makeup and hair teams led by Blanche Macdonald’s own creative masterminds. Among the 29 graduates enjoying electric nights of triumph, Savana Sheardown had more to celebrate than most. 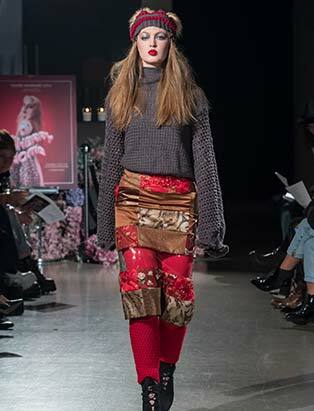 Having come to Design School from the tiny Okanagan town of Lumby, even though Savana excelled during her year at Blanche Macdonald, she was as shocked as anyone to be named as the winner of the awards for both Textile Design and Overall Achievement. 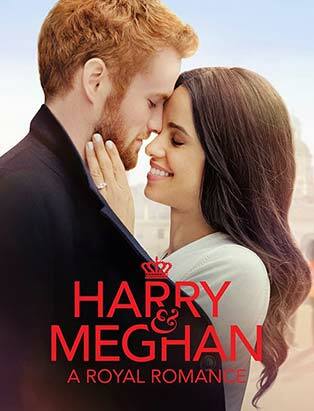 The small town girl was destined to become part of the fashion world, even before she’d moved to the big city. Enthusiasm, talent, effort, openness to feedback – Savana had it all, proving that creative success is driven by perspiration as much as inspiration. “The program was harder than I expected,” she admitted. 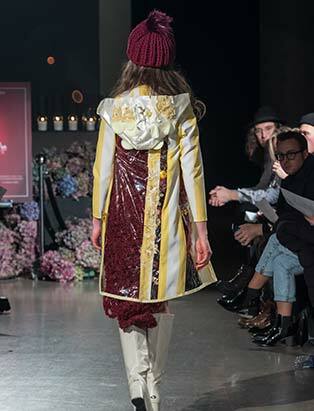 “Once I figured out pattern making and garment construction it was amazing. I could email instructors on weekends and they’d write right back. 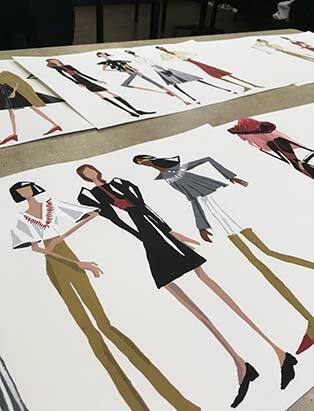 “Making my first pattern for this collection was huge. My illustrations aren’t perfect, but I could envision the ideas in my head and knew it would be different once it was sewn. With every design you have to take it from a sketch to a real garment. It was hard but in the end everything worked out. “My inspiration for this collection was all things harvest; the leaves beginning to change and the feeling of the cool crisp air. There was a bit of trial and error with getting pressed flowers into my raincoat. It’s tricky figuring out how to glue flowers into see-through panels! 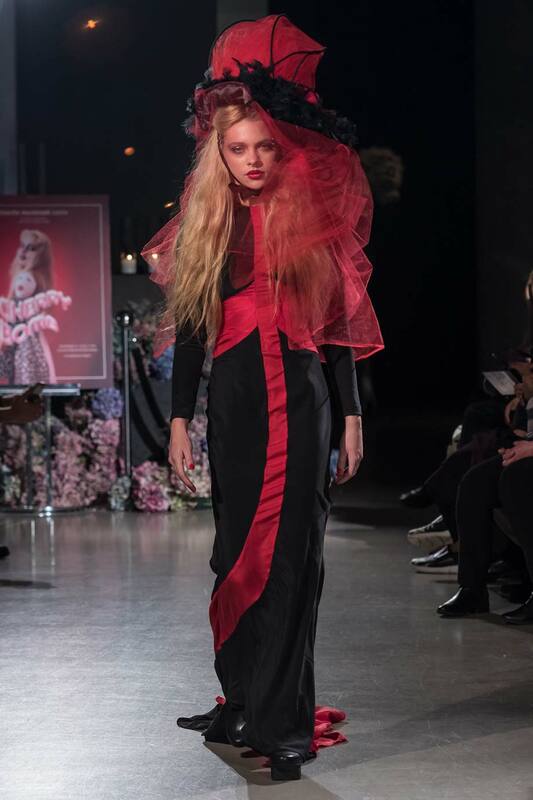 Winnipeg’s Nicole Joyce had travelled even further to join the Fashion Design Program. Walking away from Cherry Bomb with the Award for Academic Achievement made it all worthwhile. Nicole’s journey took a leap of faith as well as a flight from Manitoba. With that kind of passion, Nicole fitted into the program perfectly. “The work was all consuming but definitely worth it. When we were learning about fashion history with Donna Baldock it was so inspiring to see how elements and shapes are reused, and how you can create anything! The teachers encouraged me to pursue the images in my head. All the courses brought me to create this collection. 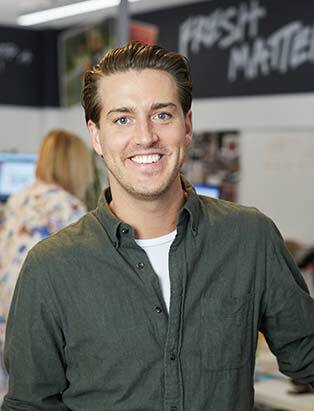 Aaron Pharness was halfway through a Fashion Design program at another Fashion School when he realized that he needed a change. 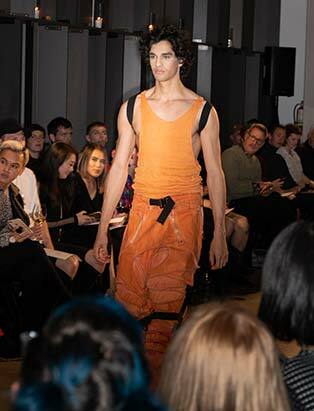 That inspiration led to an impressive menswear debut collection and a pair of awards for Portfolio Presentation and Patternmaking. “I’m really into sci-fi, so movies like On The Silver Globe, Blade Runner and Beyond The Black Rainbow were big influences. I took a lot of inspiration from some of my favourite designers’ early collections. 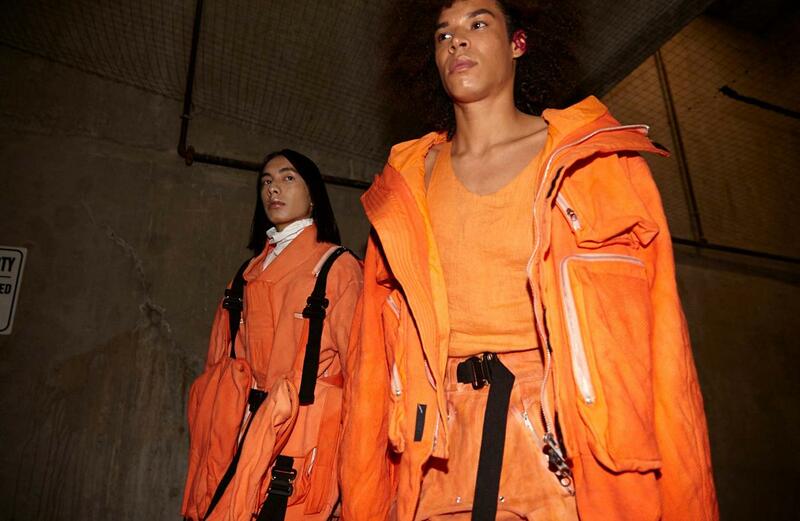 The colour orange came to me from Rick Owens and Helmut Lang. 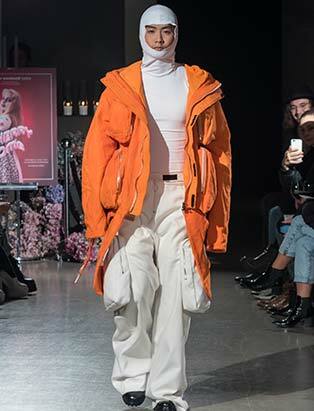 I thought that was really cool and that I could use that in a uniform sense to create a style running throughout the collection. The graduates’ hard work was a reflection of the standard set by Blanche Macdonald’s passionate and ever-professional faculty. 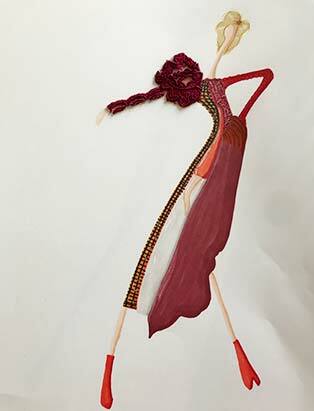 “Sara Armstrong, our Pattern Making and Garment Construction Instructor, is a warrior!” continued Tyler. “I can’t describe how passionate, earnest, organized and dedicated she is. We’re lucky to have her. Our TAs – Lukas Daase, Aman Sandhu and Hannah Ericksson – are incredible. They’re key members of our team and are growing into such strong, organized and talented designers. “Jon Hennessey is a makeup visionary and he steers a tight ship. I have so much respect for him. Serendipitously we both came to the table with one strong reference we both felt passionately about. Thinking about the iconic Robert Palmer ‘Addicted To Love’ video makeup, we wanted to know what a modern take on that would be. That ended up being the look for Cherry Bomb. 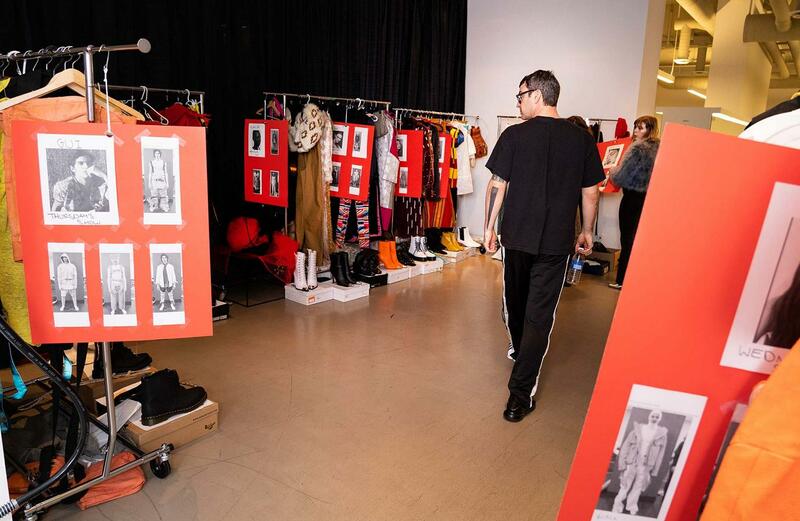 Putting on an elite graduate Fashion Show takes a coordinated effort from stylists, and makeup and hair artists to ensure every garment and model enters the runway looking perfect. It’s also a wonderful opportunity to give Blanche Macdonald hair and makeup students their first taste of backstage professionalism. “I had a team of four current Pro Hair students for 23 models,” explained Key Hair Stylist and Instructor Lisa Callender. “None of them have graduated but they all get it. I’d seen some of them work and I knew their work ethic. They’re a good bunch. “The inspiration for the male models was Edward Scissorhands. I knew I wanted that messy dishevelled look. For the women I wanted a Blondie ‘Heart of Glass’ look – like they were coming out of Studio 54 at the end of the night. As a teacher I like encouraging students to go back and look at imagery. If you’re only looking at what’s new you won’t get inspiration from what’s come before. If you want to do event work like this you need to know these references. 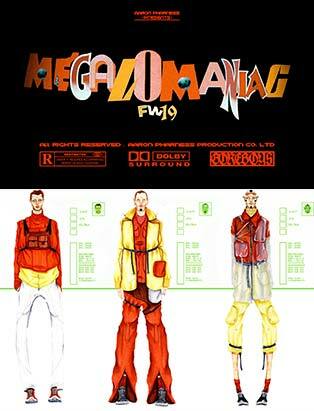 Understanding that the Blanche Macdonald Fashion Design Show is a group of collections rather than a singular vision gave Jon the challenge of creating a look that needed to be versatile yet still bold. Along with this year’s incredible designers the success of Cherry Bomb was a tribute to the hard work of the staff and students at Blanche Macdonald, with special mention due to the inspirational leadership of President Lily Lim, the endless efforts of Executive Director, Fashion Design Tyler Udall, Design Instructor Sara Armstrong, and Career Director, Fashion Department Mel Watts. Huge thanks must also go to Co-Executive Program Directors Peggy Morrison and Donna Baldock, Fashion Department Instructors Lisa Gellert, Matthew Burditt, Lyndi Barrett, Carlie Wong, and Wanda Sustersich, Teaching Assistants Lukas Daase, Aman Sandhu and Hannah Ericksson, Creative Director Liz Dungate, Associate Marketing Director Natasha Eng, Graphic Design Director Morgan Mallett, Social Media and Marketing Coordinator Jacky Le, Director of CurliQue Retail Operations Gina Hansen, Operations Director Peter Leung, and Social Media and Creative Content Coordinators Kendahl Jung and Mohamed Ibrahim Ali. 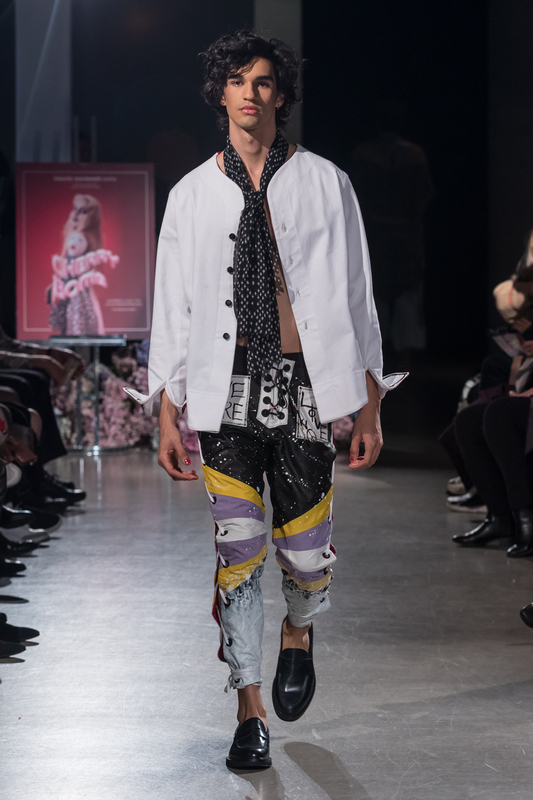 Infinite gratitude too, must be given to the backstage team, led by Tyler Udall, Sara Armstrong, stylist Lacey-June Berry and a team of volunteers from the Fashion Design and Fashion Marketing programs. 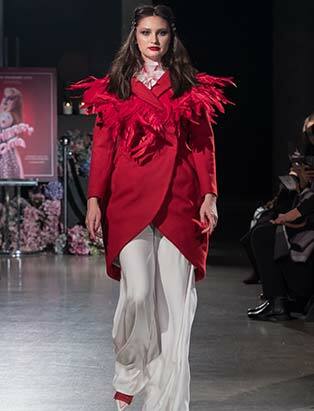 While Key Makeup Artist Jon Hennessey, Key Hair Stylist Lisa Callender and a team of volunteer grads and students ensured the models looked as spectacular as the collections. Huge thanks also to our fabulous emcee Jaylene Tyme and DJ Hana Pesut (Sincerely Hana) for providing an amazing soundtrack to the night. 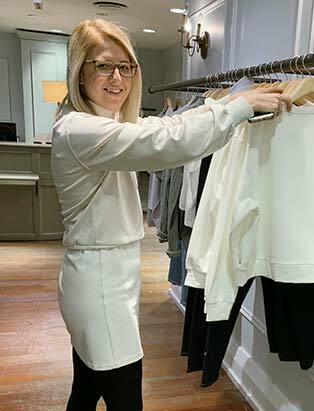 The entire team at Blanche Macdonald would also like to extend its sincerest gratitude to our corporate sponsors, gravitypope, Kevin Murphy, Make Up For Ever and Oribe, along with huge thanks to our colleagues at CurliQue Beauty for putting our guests’ goody-bags together.